‘What a demnition long time you have kept me ringing at this confounded old cracked tea-kettle of a bell, every tinkle of which is enough to throw a strong man into blue convulsions, upon my life and soul, oh demmit,’–said Mr Mantalini to Newman Noggs, scraping his boots, as he spoke, on Ralph Nickleby’s scraper. ‘I didn’t hear the bell more than once,’ replied Newman. 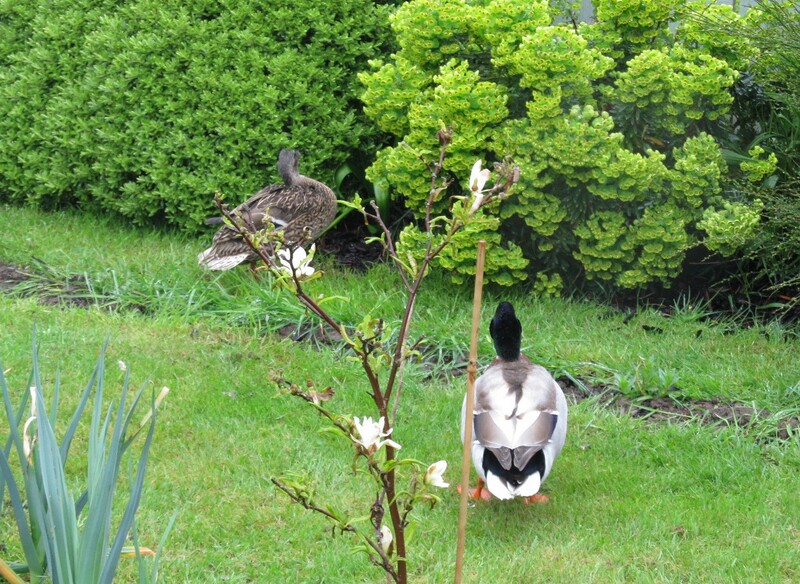 There is no way our Newman – or anyone in our house – could miss the noisy arrival of the Mantalinis, who make their way into the front garden at least twice a day – sometimes flying in but usually waddling up the road and into the drive with real determination, announcing their presence with loud and incessant quacking which is simply demanding dinner of the very finest quality. The noise, demmit, only stops when the seed box comes out, and the washing-up bowl for refreshment and bathing is moved to their liking into the centre of the grass. If the Mantalinis are in the garden when we get back from the beach, Newman and Barnaby both boom out a bark of recognition and like the chance to bounce over in their direction, if they’re not stopped. Neither of the boys means any harm, of course; it’s all just noise and nonsense, a kind of throwaway greeting of the golden kind on their way to the next bowl of jellies. And no offence has been taken, either; back the Mantalinis soon come, for another lengthy feed. The story of our Mantalinis began one early evening last summer, with the wind whistling unseasonably wild and things outside all frightening and uneasy, not a night to be out in, or to stand up in, come to that – especially if you’re a clutch of ten tiny ducklings. Continuous baby cheeping gave notice of the presence of unusual bird ,life somewhere about; but it took a little while before Kemo Sabe was able to identify the source of the song, right near the front door. After searching in storage Jeoffry’s cat-carrier, Kemo Sabe gathered the little ones up and made a towelling nest where they settled at once on the kitchen worktop and, utterly exhausted, went to sleep immediately. Later, an upturned dustbin-lid filled with water made an ideal kindergarten pond for the little folk, who neighbours across the road took in and raised (as they had no bouncy dogs like us) until they sought their independence in the village. Now it looks like one or other of them, suitor in tow, has returned, knowing they will always get a welcome up this way. If you have not come across this extraodinary couple before, you will find them and their dressmaking business in the pages of Nicholas Nickleby. 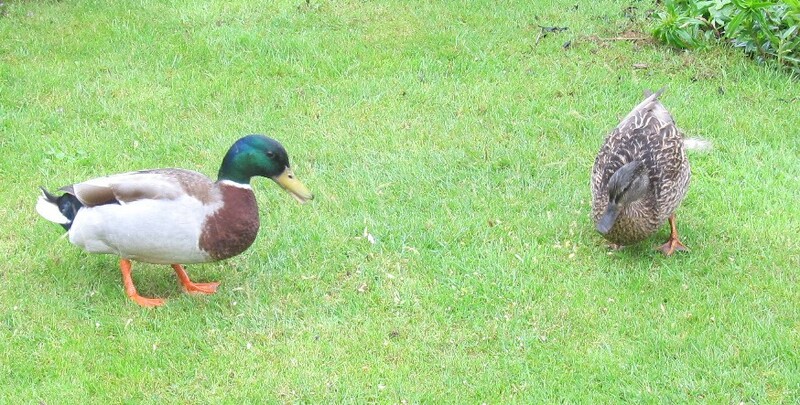 Though an early, episodic Dickens novel, it is touching, heart-breaking and hilarious by turns, and the people it brings to life are still out there today, even impersonated by our friendly mallards. You live in a stunning place and I love your posts about it! !